Calisthenics diet – what is that? And does it even make sense to talk about calisthenics diet? As you know, calisthenics are workouts where we only use our body, or bodyweight training if you want. So what’s the idea with a bodyweight training diet? Calisthenics have a simple approach towards training, as we utilize as little equipment as possible. So simplicity is a keyword. Calisthenics don’t require a gym and are often done outside. So there is a kind of connection with the environment you live in. The above give calisthenics a natural freedom. No gym, no machines etc. Freedom is another keyword. Calisthenics utilize bodyweight, which means that a heavy body would mean a more challenging workout. That might sound good. However, having a thick layer of fat wouldn’t help you in the more advanced exercises. Actually, it would be a big disadvantage. Therefore, a lower body fat percentage is important. We only want useful weight like muscles. As with any other kind of workout form, we need to get enough proteins to build muscles, plus essential minerals and vitamins for the body to work optimally. So normal nutrition rules are also applicable for a calisthenics diet. Simplicity – part of the environment/natural – freedom – low body fat percentage – general nutrition rules. One of the biggest problems with most diets is that they are so difficult to maintain in real life that we often quit after some months. Counting calories or only eating the same kind of food over and over again isn’t a good long-term solution. Solution: You need some simple habits, not rules. Food used to be natural and not something done in a factory or with chemicals. Today, processed food is a big part of our daily nutrition. Often, we refine food and lose some important minerals, fibers and vitamins, leaving the food with a lot of fast energy and nothing else. Solution: Eat natural and stay away from processed food as much as possible. 30 years ago, we were told that we’ve got fat and are sick of fat. Today, we know that this is not 100% true. Insulin is the hormone that controls fat storage. Carbohydrates like sugar, white bread and white pasta are very good at raising the blood sugar, which then again asks for more insulin. So before controlling the total amount of calories, we should start with focusing on the simple carbohydrates. Solution: Minimizing or avoiding the intake of simple carbohydrates. 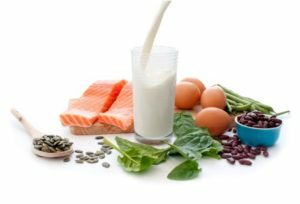 We need enough protein to build muscles and we need enough water, minerals, fibers and vitamins to make the body run smoothly. Solution: If we eat natural this will be covered automatically. Depending on how hard you train, you might need to adjust the intake of protein and water. So that’s it but I won’t leave you here. Below are some easy to follow good habits as well as a downloadable pdf. A calisthenics diet shouldn’t be strict rules but smart choices. As seen above, these products are artificial products and all the good stuff like vitamins, minerals and fibers have been removed. Red wine and beer is better than drinks, but you should limit your intake both due to general problems with alcohol but also due to the simple carbohydrates. To make it simpler, here are two lists: one for what we should have in our kitchen and one for food we should remove from our kitchen.